Justified is the saga of Deputy US Marshal, Raylan Givens, who grew up fast and hard in the poor, coal-mining hills of eastern Kentucky. As a young man with dreams of a better life, made possible by financial help from his aunt, Raylan hit the ground running, joined the Marshal service, and never looked back. In the opening sequence of season 1 (episode 1) we find Raylan in sun-scorched Miami, sitting at a table in an outdoor restaurant across from drug cartel hit man, “Tommy Bucks”. In a scene straight out of a Gary Cooper western, Raylan gives Bucks an ultimatum with a two minute warning: either leave Miami and live, or draw and die. Betting that the Marshal is bluffing, Bucks calls him on it, pulls a gun, and ends up with 3 slugs in his chest before the entrée arrives. Even though Bucks pulled first, the fact that he was shot at a high profile public place in broad daylight unsettles Raylan’s superiors. Afraid of the political heat it will generate, his boss “reassigns” him to the Lexington office in Kentucky. But this puts Raylan uncomfortably close to his birthplace, Harlan County, his volatile, Vietnam veteran Father, Arlo, his old acquaintances – most of whom are criminals – and his ex-wife, Winona. This is the jumping off point for the show and where the story really begins. But the scene above sets the stage for the entire series and provides a window into who Raylan is as a man, what makes him tick, and why. At first blush, the show seems to be a fairly straightforward contemporary western with a mix of old style charm. As such, it doesn't appear to lend itself to reflection in the way Six Feet Under, or, more recently, The Leftovers do. Nevertheless, it’s there just under the surface in the relationship between Raylan and his father, particularly as it connects with the issue of masculinity. Arguably, everything significant about the series leads back to that relationship, his connection with Harlan County, his upbringing there, and how his masculine sensibilities were shaped as a result. 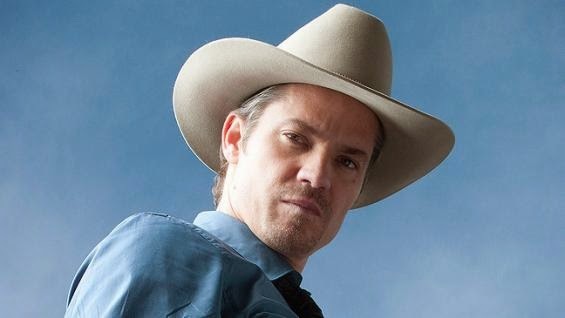 As the series develops, it becomes clear Raylan has an unapologetic, old school sensibility; and with his disarming, street smart ways, not to mention his quick draw hand, he is a Marshal to be reckoned with. But while it’s true Raylan gets the job done, often with much fanfare and flair, the truth is it’s more often on his terms and in ways that meet his needs. Moreover, we see that for all his competence as a lawman, Raylan is profoundly disconnected from himself and others, and we witness this primarily in the re-kindled relationship with his ex-wife Winona (and later with Ava Crowder), epitomized in his posture of avoidance, and general unavailability. 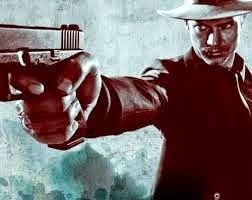 Nevertheless, we are seduced by Raylan's boyish charm, his easy manner, and his cool head under fire. But underneath that cool and controlled exterior is a very angry man. In fact, at the end of the first episode of season 1, Winona tells him precisely that, much to his apparent surprise. When one considers that Raylan would rather face a bullet than risk emotional involvement, we glimpse just how deep and painful the masculine wound is. That Raylan's presenting self is quick to fight like a man, but his emotional self would rather take flight than risk intimacy, indicates how powerful male bravado is as a strategy of avoidance that lies at the heart of more traditional forms of masculinity. It would appear there is courage, and there is courage. That Raylan does what he does without apology stems from the fact that he knows precisely and absolutely who he is. He is a Deputy US Marshal, he's one of the good guys. That's where his investments are, that's what defines him, and that's what orients him. Things couldn’t be any different, otherwise his very identity would be up for grabs. The fact that Harlan County, his criminal father, and the violence he left behind are nipping at his heels is something Raylan simply can’t entertain, emotionally speaking. For Raylan, the past is the past; and when he left home it disappeared in his rear view mirror in more ways than one. But while Raylan may have left Harlan County, it seems Harlan County never left Raylan. When one also considers his upbringing in a veritable war zone, where, at the hand of his father, physical and verbal beatings were commonplace, Raylan learned as a young boy to keep his head down, his mouth shut, and his fists clenched. While that strategy was designed to protect him from a very real and obvious physical threat, it also served to shield him from a less obvious but no less real emotional threat. As it is with Raylan, anger is arguably the mechanism behind most masculine excesses that marks you at an early age and helps create protective vests and assorted strategies that numb emotional pain and hide fear. With this in mind, when one further considers the striking similarities between these early strategies and Raylan’s later ones, it seems clear they are rooted in the same place designed to achieve the same thing, that is, protection at all costs. This gives reason for pause and helps us connect the dots. The very fact that the function of institutionalized law is to make distinctions, that is, to separate the just from the unjust, is a perfect fit for Raylan, enabling him to hide from, yet justifiably express, his righteous anger. As a wounded man with a badge and a lawman’s view of the world, Raylan has a license to make hard and fast distinctions that effectively blinds him to the precarious relationship between the law and justice, and that the job of the former is to approximate the latter. If it’s true the very system Raylan has given himself to, aids, abets, and reinforces those early survival strategies, it also helps put the capstone of legitimation on an already tightly controlled world where defensive strategies prevail. In this way, we begin to see that the masculine wound is inextricably linked to and perpetuated by the very institution that claims to be on the side of justice. Whether it be political, economic, religious, or academic, one can persuasively argue that to the extent such systems rely on absolute distinctions, and therefore function as ends in themselves, they are anything but just. Significantly, though paradoxically, what makes Raylan tick is fear: fear of being out of control, fear of being caught off guard, and fear of being at the mercy of the other ("bad guy"). As I alluded above, anger is a survival mechanism that helps hide fear and then helps replace it with protective strategies unique to the person and their circumstance. But even more fundamental is the shame that sits at the bottom of fear and informs it. Shame is the glue that keeps such strategies in place and perpetuates them; it’s what tells a boy he is worthless, that he’s not good enough and never will be. If shame runs this deep in the masculine soul, it’s sobering to consider just how far it reaches into our homes, our institutions, and our culture, not to mention the relationships intrinsic to them. Importantly, it is in relationships, with their call to trust, where the threat of exposure and pain is the greatest and where emotional reticence reigns supreme. Why? Because that’s where we’re called on to drop our guard; but since that’s also where we were wounded at our most innocent it’s a place we instinctively protect at all cost. Relational involvement, then, is where the greatest resistance lies and where defensive strategies assert themselves. For Raylan, and men like him, the prospect of taking a physical bullet is far less painful than risking an emotional bullet that penetrates the core of who you are. But taking a bullet, or otherwise sacrificing oneself for the cause, is precisely what human systems and their laws always demand. To be sure, nothing less than a man’s soul is the price they exact for the promise of immortality they can never deliver. In the face of our brokenness and fear, the painful truth is that it’s much easier and far more comforting to rely on the systems we create as ends in themselves, instituted by the gods and enforced by men. But when any system is allowed to have the final say we relinquish our responsibility and forget our humanity. Like all good stories, Justified draws such issues to the surface, allows us to wrestle with our fragile constructions, and invites us to ask whether or not they are justified, and therefore just. 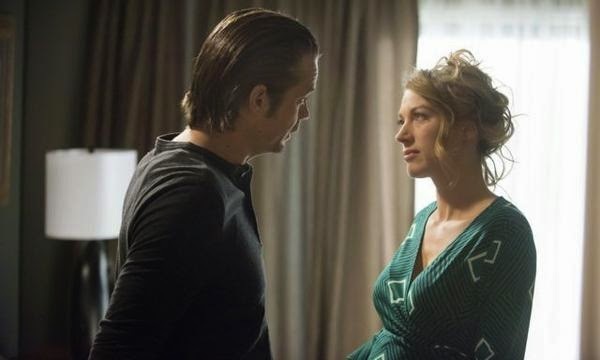 With the final season of Justified now well under way, my questions are these: who or what will Raylan face in the final showdown? Will he kill or be killed? Or, will he, can he, live and let live? I find it interesting to note how often it is that the vehicle for exploring and exposing masculinity begins with the most common American male hero archetype: the lawman. It makes me wonder if there isn't a connection between the theological idea of justification and the title of this TV series, perhaps an allusion to a felt need to become justified on a spiritual level not merely a legal level. Other recent shows that rely on this archetype spring to mind: The Walking Dead and Banshee, for two. I also wonder if even using the heroic male archetype to explore the destructive side of masculinity -- the side that makes us seek and accept unreasonable risk, and prefer anger to more emotionally vulnerable ways of working with fear -- isn't itself reinforcing the cultural conditioning that males receive as much as giving us means to examine it. The Walking Dead confronts this side of masculinity at several turns in the plot, and Banshee embeds it in the lawman character directly, but we still hope for the heros to prevail by virtue of the masculine attributes that so often serve them poorly. There seems no limit to the number of bullets and broken bones that our heros can take before we acknowledge their victimhood as well as their heroism. Thanks for the thought-provoker, Shane! 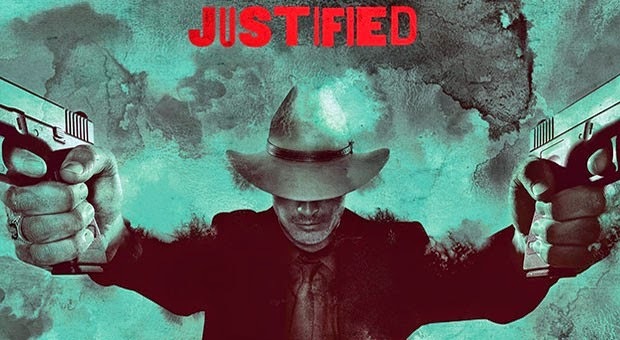 I haven't seen Justified yet but I am hoping it appears in my Netflix account someday soon. Thanks for your comments, dz. I feel an essay length response coming on but I'll resist and say just a few things in reply. I think both the lawman and the military man are powerful masculine touchstones for North American culture in particular - America even more so. As the American fear-mongering machine would have us believe, these are the men who will save us from THE enemy, both within our borders and from without. At least that's how the story goes. So you're absolutely right to suggest that the machine perpetuates sameness and thereby reinforces cultural conditioning, even as it provides the means of critical reflection. I think you're also right about the "felt need" or the yearn we all have to reach for healing, justification, and redemption. Whether or not filmmakers or TV series creators/writers have explicit faith commitments, I'm always struck by and fascinated with how all good stories are particular frames used to explore universal, often deeply theological themes, issues and questions. For example, if Justified asks: what does it mean to be a man? The Walking Dead asks: what makes us human? As for Banshee, the question it provocatively asks is this: is human change or transformation possible? The answer is a resounding "no" says Jonathan Tropper, writer, co-creator, and executive producer of the show. As a self proclaimed naturalist, and biological determinist, Tropper believes that human change in fact is not possible. All the bloodshed, mayhem, death, and destruction that Lucas Hood (and Kai Proctor) perpetrates on himself and others is the result of trying to pound a square peg into a round hole. When you bang your head against a deterministic wall trying to be who you're not, that's precisely what you get. The great thing about a show like Banshee (not to mention Justified and Walking Dead) is that it dares us to ask good questions about the kind of story being told and the philosophy being espoused. In so doing, we stay vigilant and keep them from running roughshod over us. And we don't need a 9mm to do it! Hi Shane. You have me thinking now that stories need to begin with what we already "know", and cliché heros certainly satisfy that need. Since we males are well trained in identifying with stereotypically masculine heros, the masculine hero is an effective tool to get us to reflect critically on that. If done skilfully, such characterisations might allow us to nudge our understanding more than they simply provide reinforcement of cultural conditioning. I did not know that about Tropper. It certainly adds a new level of interest to those stories for me. Thanks. I wonder how his biological determinism sits with Hoon Lee's character. Perhaps he's test-driving his commitments in the show as much as he's expressing them.